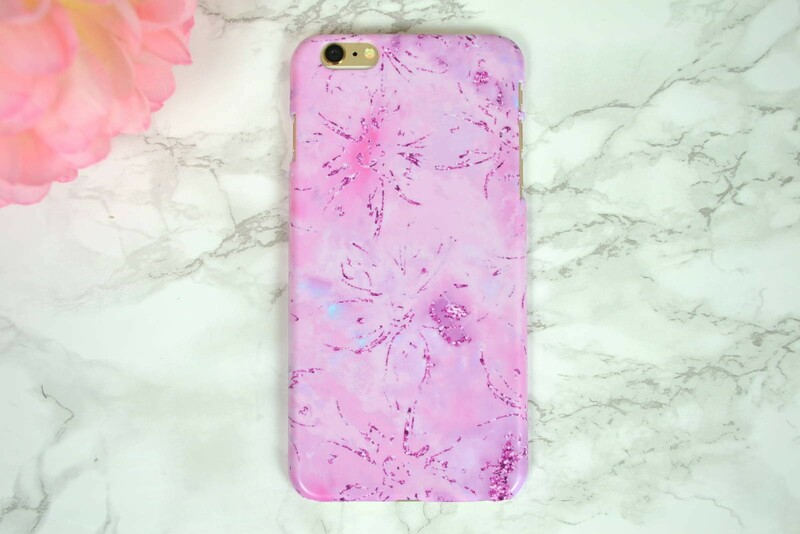 Mia Felce Phone Case – I’m actually really excited to be writing this post as it’s something a little bit different! I recently switched from an iPhone 4S to an iPhone6 Plus and as I’m writing this I realise it’s not ‘recent’ it’s actually a year ago now that I switched! How time flies!? Mia Felce is a printed textile designer based in the UK and she graduated from the University of Northampton in 2013 with a BA(Hons) in Fashion (Textiles for Fashion). Her graduate collection was shown at Graduate Fashion Week and was also shortlisted for the Gala Award Show. Mia Felce Phone Case – How are the designs created? Mia takes time to work on all her prints – she originally creates them by hand which are then ‘manipulated‘ by a computer, developing them into digital prints which are them applied to phone cases and notebooks! As you can see in the picture above, the packaging is very cute, very girly and I really like it! The design on the front of the postcard is one of Mia Felce’s original designs too – how cute it that! Scrolling through the photos you’ll be able to see the actual phone case, up close – and personal! What I love about the designs is that you know that someone has taken the time to sit down and design something unique, something special and that’s really wonderful! The texture of this Mia Felce phone case is hard, it’s a click-on case which can sometimes be a pain to remove when you want to switch to something else but so far this hasn’t been a problem! Priced at £15 (incl VAT) – it’s not bad at all when you know that these pieces have been specifically designed by Mia. It’s not something that you’ll see everywhere either which is lovely! I actually think these would be great as little stocking fillers too – I mean how cute would this be!? Have you seen Mia Felce online, purchased anything from the brand? I’d love to know! Ah this is so pretty & girly, I love it! I’m due an upgrade on my phone in a couple of months so I’ll be looking for some new cases, I’ll definitely bear Mia in mind!! That case is gorgeous! I Love the colour and print on it! You’re so talented! I love this phone case, looks gorgeous! Amazing design! Aww, it looks adorable, Layla! So cute! And I totally love what you’re wearing, babe! Aww it’s pink, it’s cute, I want it. It’s such a pretty case! Wow the case looks super cute! Beautiful phone case ! Love the color ! Such a nice post, you’re so pretty! Yay! I have to check the site! My gosh, you look sooooooooo beautiful. Love your new phone case. So pretty!!! Great post! ps: How are you liking the iPhone6 plus? I wanted that but it was a freaking long waiting list for it in the town where I live so I opted for iPhone 6 instead. And now freaking 6s is out…drives me nuts. LOL! Thank you for your comment too – I replied to your question on your blog but just in case you don’t see it, I love the iPhone6plus and won’t be switching to the 6s as it’s rather similar!